LEN - www.lankaenews.com | President Gamarala to advance date of presidential elections ! Snap elections in two months ? 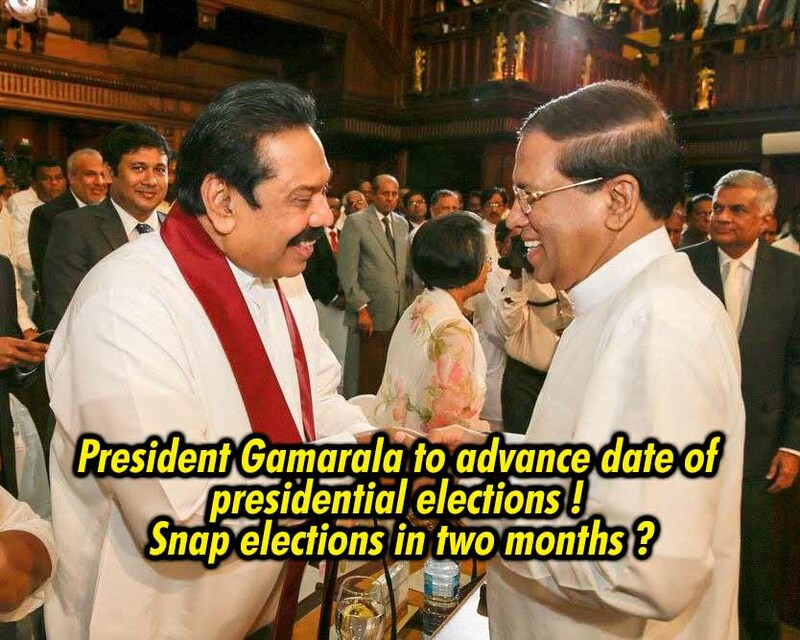 President Gamarala to advance date of presidential elections ! Snap elections in two months ? (Lanka e News -02.Aug.2018, 9.00AM) By virtue of the legal rights vested in president Gamarala , the latter is trying to go for presidential elections in 2019 and not 2020 ,according to reports reaching Lanka e news inside information division. The president can call for presidential elections after he has completed four years of his official term . This is stipulated in the 19 th amendment. That is the president can hold presidential elections in 2019 – on 2019-01-08. If that is so, the president has the legal right to announce the presidential elections in September end or beginning of October this year. The UNP faction which is currently most strong within the consensual government is right now most vigorously carrying on its projects with assiduous ardor : Gamperaliya , generating 100, 000 entrepreneurs , augmenting the welfare activities of the education and health services are some of them ,and if it maintains this momentum it is going to be most popular among the people . President Gamarala who is best noted for running with the hare and hunting with the hounds , is harboring the fear that the UNP will become popular , and also being fully aware he will definitely not be the UNP presidential candidate , has entered into an agreement with the Rajapakse regime to advance the date of presidential elections, and is taking measures in that direction , based on reports reaching Lanka e News inside information division. President Gamarala who is always led by the most misled NGO crook and political outcast Shiral Lakthileke has offered another ‘D -rope’ to gullible most fallible Gamarala . He had advised Gamarala because the Rajapkses are having a power struggle within and are without a suitable presidential candidate , Gamarala should step in to fill that vacancy . Hence if Gamarala is to be made the presidential candidate of that camp through Mahinda Rajapakse by Gota exerting pressure , and with that vain hope it is possible , Gamarala has got ready to advance the presidential elections to 2019 from 2020 so that the Rajapakse camp can clinch that advantage . Both sides are now exchanging views , and if Basil who is bitterly opposed can be won over , Gamarala is prepared to make the announcement in October and hold the presidential elections in January 2019. Be that as it may , it is a well and widely known fact it is India which takes the decisive stand and contributes heavily as regards the power balance in SL . Sadly , based on information reaching Lanka e News inside information division , about two weeks ago , it had arrived at a carefully considered conclusion that president Pallewatte Gamarala is most undependable and untrustworthy .